The Journeyman Project 3: Legacy of Time continues the Journeyman adventure with similar science fiction themes and gameplay to the previous games. The game was released in 1998, 3 years after the second game in the Journeyman Project was released. 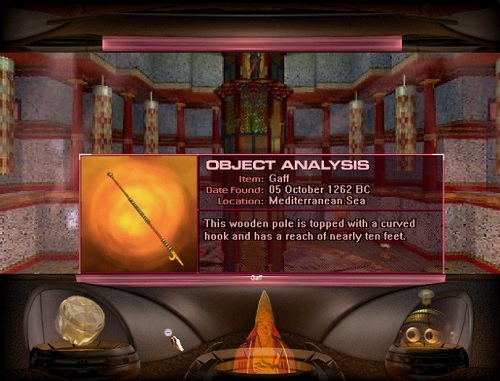 In The Journeyman Project 3: Legacy of Time the game introduced pre-rendered 3D visuals to the game that allowed the player to explore the various locations with detail and flexibility not previously seen before. The story continues the adventures of the player as Agent 5 (Gage Blackwood) and again revolves around time travel and the ancient world. The game is set several years after the player’s success in The Journeyman Project 2 and features a world without the Temporal Security Agency (TSA) after time travel has been shut down due to security concerns. This didn’t stop the rogue Agent 3 from opening up a temporal rip in space time though which requires the player to deal with the issues of time travel once again. Players go back in time to track down Agent 3 and finally stop them for once and all. During your adventure you find that once again aliens have been meddling in Earth’s affairs and have been destroying ancient civilisations for an ancient artefact under the name of the Legacy of Time. Players (and their AI companion Arthur) take it upon themselves to gather the pieces of this alien relic by visiting the lost cities of El Dorado, Shangri La and Atlantis. Not only are these locations impressive the player can also interact heavily with the game world thanks to the improvement in game technology and the added ability to communicate with NPCs (which was forbidden in previous games due to time travel laws). With plenty of improvements over the original games but the same level of adventure The Journeyman Project 3: Legacy of Time is another must play adventure from the past. Improved technology and graphics adds a lot of realism. Explore 3 lost and mythical cities. Another impressive story to follow. New ability to interact with NPCs thanks to Agent 5s holographic tool.